Presso la svizzera Hat Hut si possono già sbirciare i contenuti dell'imminente nuovo album di Mike Westbrook Starcross Bridge, previsto per fine estate, più o meno quando anche la tedesca Enja svelerà quel che del Nostro tiene in serbo. Nel frattempo l'omaggio a Lou Gare sta conquistando i cuori, non ultimo quello di Richard Williams, che ne scrive presso The Blue Moment: "There was a special magic about Lou Gare’s saxophone playing, as many people rediscovered when going back to his slender discography on hearing of his death towards the end of last year, at the age of 78. 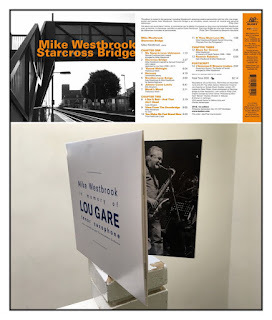 Now Mike Westbrook, in whose bands Gare played in the 1960s and again in recent years, has done us an enormous favour by assembling and releasing a CD containing nine examples of his mature playing in latter-day concert and club performances with the Uncommon Orchestra."